trading faces: Pictures so far...beware! I thought it would be appropriate to post some photos of before and just after so as the swelling starts to subside, we can enjoy the progress. 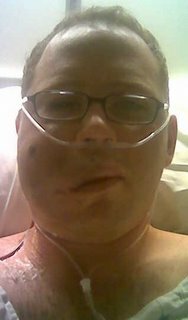 Warning: the latter photos on here might be a bit difficult to view considering they are almost immediately post-surgery. Let's take the tour, shall we? 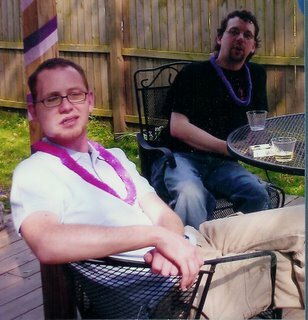 Here Craig & I are this past summer at Amy & Melanie's Derby party. Craig is in the process of growing out his hair at my insistence. It looks a bit like a mullet here, but I swear it is great now. I am not entirely certain, but I believe that I am in the process of stepping right past that fine line of how how much wine one should have. This is my adopted dad Chuck and me at the Homer Laughlin China Collector's Association (a.k.a. fabulous Fiesta dishheads!) 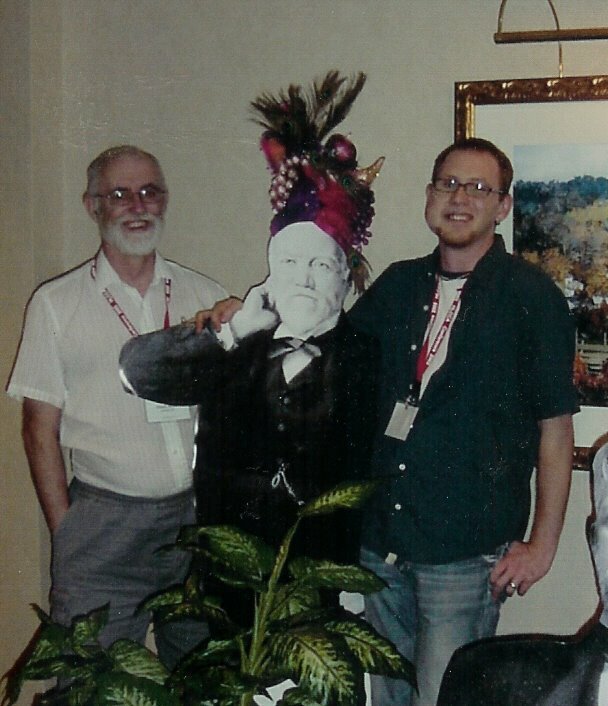 conference in July 05, posing with a very festive industrial baron of the early 1900s. 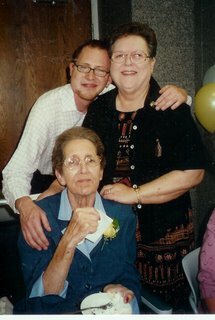 Here is my with my grandmothers at a wedding over the summer. This is the sort of picture I would receive and destroy under previous circumstances...it makes the VM too visible for me to handle, especially in the paper version of the photo. Very few closeup pictures of me even exist if they have ever passed through my hands. AND NOW FOR THE REALLY SCARY STUFF!!!! Taken a couple of hours after being put under on Wednesday and being pumped full of sclero solution meant to harden the tumor so it could be easily separated from healthy tissue. Someone really decided to fill it to the rim. It actually looks far more uncomfortable than it feels at this point. Sometime after I woke up from surgery and was hitting my morphine pump, I took this with my phone. I could not tell you when as I don't actually remember taking it. This hurts, and is my jumping off point for the swelling reduction marathon. I'm actually so swollen you can't see the very long incision going from in front of my ear to under my chin. It is still swollen pretty far forward around my mouth especially, making it hard to eat at the moment, but I'm actually getting along fairly well now. 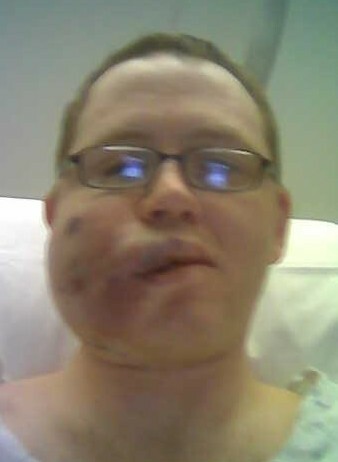 I can say I look much better than this at the moment! And just as a palate-cleanser after that horror, here's Truman, looking remarkably slim (the photographer is clearly a genius), disdaining the Fiestaware dish his papa purchased for him. If I have some more good progress, I'll post some new stuff in the next day or two so you don't all think I'm still suffering as badly as I am in the above pics. Really, right now it looks mostly like it did before surgery, just in different places...strange indeed. And of course you'll get to see my developing beard! 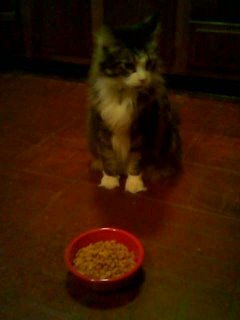 Where is Rush Limbaugh's maid when you need her?